What now for the world champions? We have reached the point where it is all happening. Shame RVP never played like this for Moyes. Casillas....contender for worst WC game so far? Wow what has happened to Casillas? No man's land for the 1st goal, pancaked for the 3rd, blatant error on the 4th. This is only the 2nd time in its World Cup history that Spain has allowed at least four goals. The other was a 6-1 loss to Brazil in the final group phase in 1950. Shoulda brought some youth along, Spain. ole ole ole ole. ole, ole. go oranje! Saint Iker not looking so saintly right about now. the WC has officially begun!!!! Thank you Oranje'!!!! Sergio Ramos bends a free kick narrowly wide from 25 yards, but surely it's too little, too late now. I would love to see Spain vs Brazil in the round of 16. That's not nice about kuyt. Jumping to conclusions, a Netherlands vs Argentina semi would be fascinating. Fair to say Holland are favourites after this display? Tom, do you remember the names of your regular commenters here in boot room? If you keep commenting, you'll be one of my favourites! We've had some great regular contributors so far, keep it up! Socceroos to win the tournament. You heard it here first. Can Spain keep it together after that whooping. Tomorow the four games have boot room? You've done a great job as well Tom! Gab, your status as a favourite is comfirmed by that flattery! Tom don't you think the Europeam teams are being horribly underestimated?No one backing the four-time and three-time champions.People seem to think football is a completely different sport in South America.Germany and Italy are very much capable of beating and thrashing any South American team on any day. 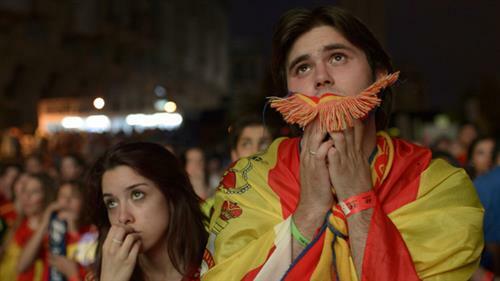 Following its loss to the Netherlands SPI gives Spain a 34.3% chance of advancing to the knockout stage. Before the match SPI gave Spain a 78.6% chance of advancing. Jack - history isn't on their side in South America, but it's such an open tournament - who do you have as favourites? How much credit does van gaal deserve? Yes, Tom. Thanks for corralling us for an entertaining match! Looking forward to it, kanishk! From one Tom to another, thank you Tom.